FILE - Members of Brazil's Battalion of Special Operations (BOPE) participate during a crisis simulation exercise conducted by the BOPE to show the media how security will be provided during the 2016 Olympics at the Golf Olympic bus station in Rio de Janeiro, Feb. 11, 2015. Last week's Paris killings have raised fears about the 2016 Olympic Games in Brazil, a country with so little history of terrorism that the president has played down the chance of an attack and legislators long resisted bills to make it a crime. Diplomats in Brasilia say Western governments are worried about the safety of their athletes and tourists at the games because they believe many Brazilian authorities are complacent, taking too much comfort in Brazil's historical standing as a non-aligned, multi-cultural nation which is free of enemies. President Dilma Rousseff last week brushed off the possibility of an incident in Brazil like the Islamic State attack in the French capital. "We are very far away," she said after a summit in Turkey. "Brazil is way behind in preventing terrorism," says Fernando Brancoli, a researcher on the Middle East and security at the Getulio Vargas Foundation, a think tank and business school in Rio de Janeiro, the host city. But Brazilian officials, eager to pull off South America's first Olympics, say they will ensure a safe games, which start August 5. They argue that Brazil is used to hosting major festivities, like the huge annual Carnival celebrations in Rio and elsewhere. "We have safely hosted other big events," said General Luiz Felipe Linhares, the Army official in charge of preparations. "The Olympic Games, a bigger affair, will be equally successful." Organizers are using past Olympics as models, cooperating with foreign intelligence services and building upon a successful safety record last year, when Brazil hosted the soccer World Cup. 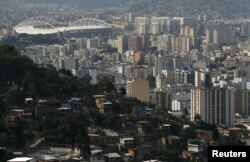 Compared with the last summer games, in London in 2012, they are doubling security personnel to 85,000 people. The government's point man on security for the Olympics, Ministry of Justice secretary Andrei Rodrigues, traveled to Washington this week to deepen cooperation with the Department of Homeland Security and other U.S. agencies, aides said. The U.S. government has invited Brazilian security officials to learn about security at mega events like the Super Bowl and briefing them on crisis management at attacks like the Boston Marathon bombing. Brazil's federal police, a widely respected force that includes a professional counter-terrorism unit, has been lauded by many foreign governments for improving immigration controls in recent years and being more aggressive against international fugitives. Even so, Brazil's thousands of miles of borders, much of which cut through dense Amazon jungle, are nearly impossible to control. And Brazil's Congress last month passed a bill allowing the government to exempt citizens of some nations from visas to attend the Games. "The Paris attacks show that terrorism is an increasingly transnational crime," said Senator Aloysio Nunes, who recently pushed the terrorism bill, backed by Rousseff, through the chamber and is hoping for approval by the lower house. "This law will provide tools to act against terrorism and cooperate with other countries fighting it," he added.